Synaptics has a long history of supporting local communities and those around the world. That’s why Passion to Make a Difference isn't just a core value; it’s how we actively engage with organizations that reflect our high regard for social responsibility. We encourage our employees to give back to their communities in ways that they feel are important, while we provide support to global causes that positively impact people's lives. Passion to Make a Difference is about dedication to our communities. We support organizations serving the communities in which we operate. Synaptics supports organizations that focus on medical research, treatment and service advocacy. Passion to Make a Difference isn't just about the money we donate; it’s also about the time we dedicate to making our communities better. Employees are able -- and encouraged -- to take paid time off to volunteer with approved charitable organizations and educational programs that are meaningful to them. We support organizations that improve the communities in which we operate, such as agencies fighting poverty and hunger, and those supporting environmental conditions, STEM education, veterans services, and programs dedicated to the arts. The organizations we support include: American Cancer Society, Bike for MS. Camp Haccamo for disabled youth, CineQuest, East Avenue Grocery Run for Foodlink of New York, Family Giving Tree, Habitat for Humanity, Have a Ball Golf Tournament for Cancer Research, Humane Society of Silicon Valley, Lucile Packard Children’s Hospital, Run for the Cure, Science Buddies, Second Harvest Food Banks of Santa Clara and San Mateo Counties, Silicon Valley Bike Coalition, Silicon Valley Turkey Trot, Stop Hunger Now, Turning Wheels for Kids, Veterans Supportive Services Agency, and We Teach Science. We support national and international nonprofit organizations that focus on medical research, treatment, and service advocacy for diseases such as cancer, heart disease, diabetes, lung disease, Multiple Sclerosis and Alzheimer’s. Synaptics provides support for employees by paying entrance fees for runs, walks, marathons, triathlons, and bike rides that support these organizations. The Synaptics Corporate Philanthropy program supports our employees’ passion to make a difference. We have contributed more than $250,000 to recovery efforts. Synaptics works toward improving the environment. The Synaptics Corporate Philanthropy program supports our employees’ passion to make a difference by focusing on the world's most pressing issues concerning health and social services, education, community and economic development, and disaster relief. Synaptics employees, combined with company matching donations, have contributed more than $250,000 to recovery efforts around the world, including relief for victims of typhoons and hurricanes in the Philippines, Taiwan and the U.S.; earthquakes in China, Japan and Nepal; and flooding in Thailand. While Synaptics creates products that improve how users interact with their intelligent devices, we also work toward improving the environment. Our commitment to the planet includes environmentally friendly product design and packaging, waste management, efficient office buildings, and corporate recycling programs. Synaptics is committed to adhering closely to the various and evolving environmental regulations around the world – a commitment that includes eliminating harmful chemicals from electrical and mechanical parts, semiconductor devices, printed circuit boards, and other materials from our third-party manufacturers. Just as social responsibility is part of the Synaptics fabric, so too are employees' pursuits and their support of a cleaner environment. 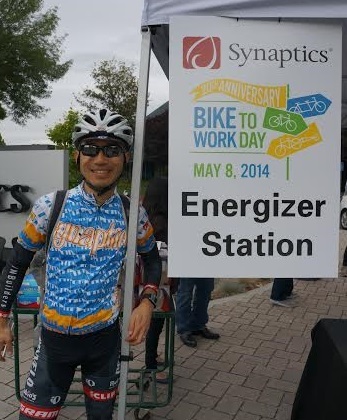 Andrew Hsu's life-long passion for cycling, which he shares with fellow employees, is highlighted in this interview. Synaptics has been very generous to those of us that are making an effort to introduce our co-workers at Synaptics to the joys and benefits of bicycling to work. Synaptics is committed to operating our organization in a fair, socially responsible manner at all levels.